Book your test sail now! | bookings now accepted! Propulsion will be Diesel-Electric: centered, quiet, eco friendly. Recuperation, regeneration will allow an average use without any generator noise, but with the amenities of modern life. All sailing can be done single handed. 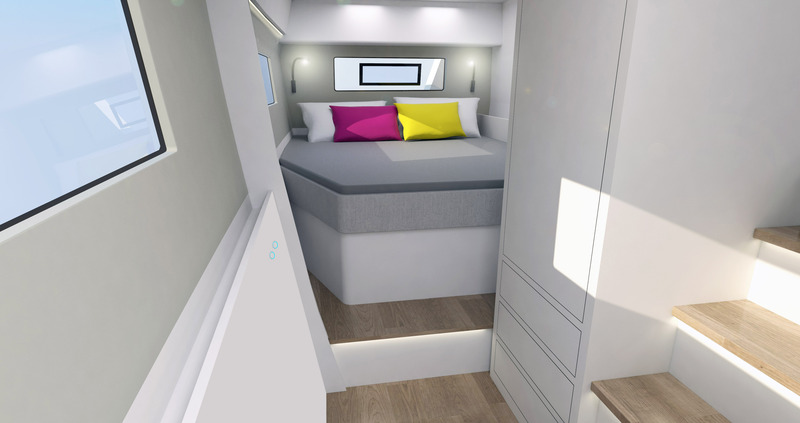 vcatamaran has put together, what todays technics and hydronamics deliver: Living in comfort and eco friendly; and sailing will be on the fast side! Hybrid propulsion delivers many advantages. Most important for us is to center the weight of Generator and Batteries in the center of gravity of the ship. Combined with other heavy items, that are also housed around the mast bulkhead, we will have no moving dynamics against the waves. 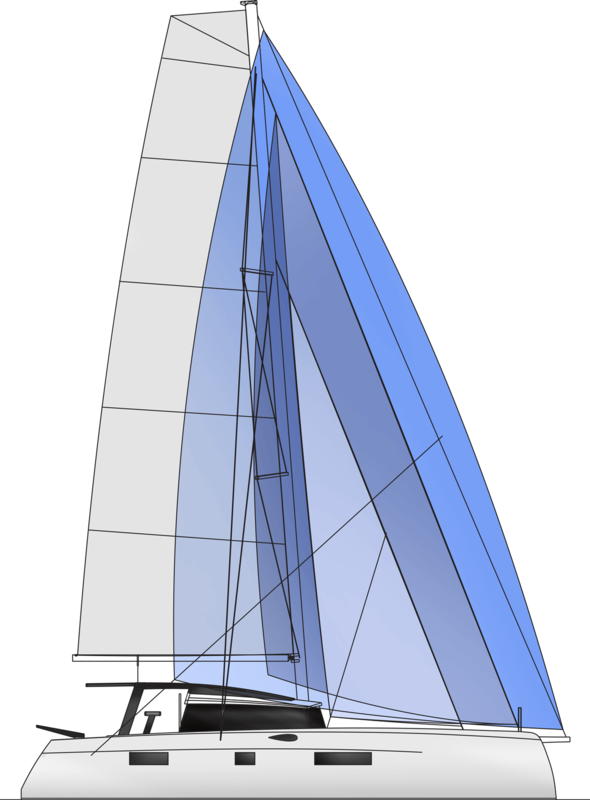 For the true sailor the VCAT44 will be a fully electric driven ship. When sailing, the recuperation mode will restore enough energy, to motor to a bay or harbor and stay there for three days without needing the genset. At your anchorage you can enjoy all amenities, you expect from a modern owners ship. Cook with induction, use fridge and freezer without the noise of a generator. This adds another unique quality to the VCAT44: no noise at anchor. If you need the security of engine support, you can rely on 100 hours motor driven propulsion. The generator will give you a range of 600nm with the Oceanvolt electric drives! And using the sails, you can create your own apparent wind, which will give you a range, many times longer than 600 miles. We wanted the VCAT44 to become a very fast cruiser. The VCAT44 R will only have an empty weight under 7000 kg, and the VCAT44 GT will weigh under 7500 kg. High sailing speeds can be achieved only when the boat weight is low. 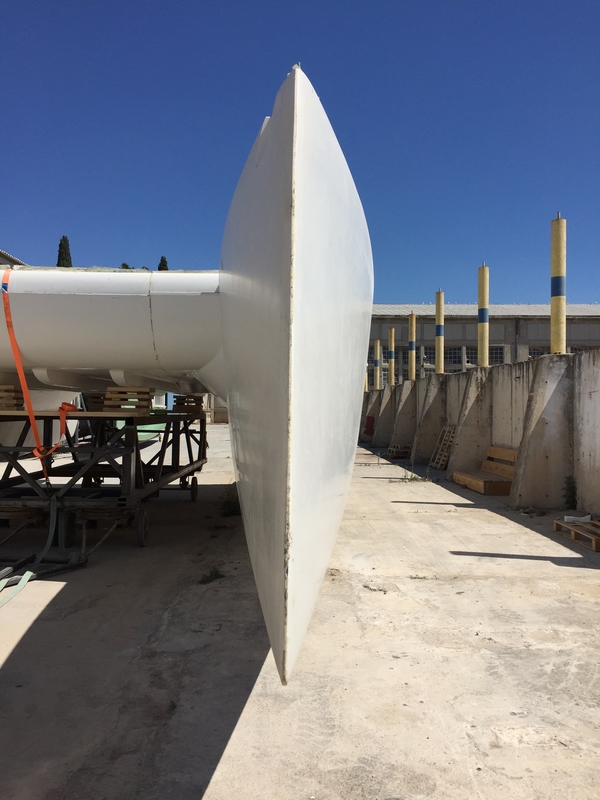 Also the sail area can be smaller and more convenient for a short handed sailing and still deliver the speed you are looking for. The sweet spot of the VCAT44 will be between 5 and 15 kts true wind. The owner will be able to reach windspeed with no effort. A experienced crew can sail faster than 20 kts. Electric winches give comfort for deck handling, but the drag forces are low enough to handle the VCAT44 without them. 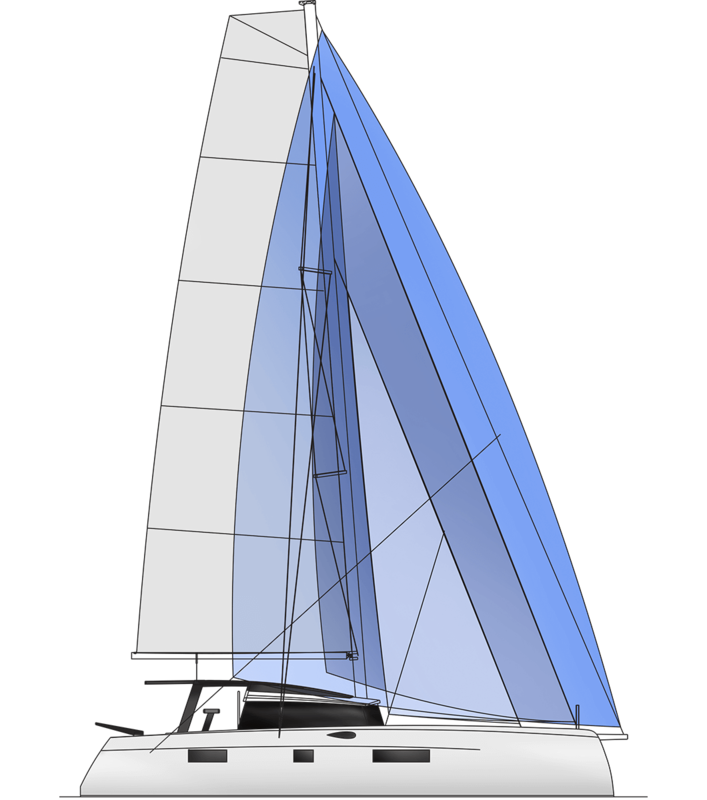 The modular interior allows the VCAT44 to be a club racer and a owners ship at the same time! You can customize the VCAT44 to your needs. 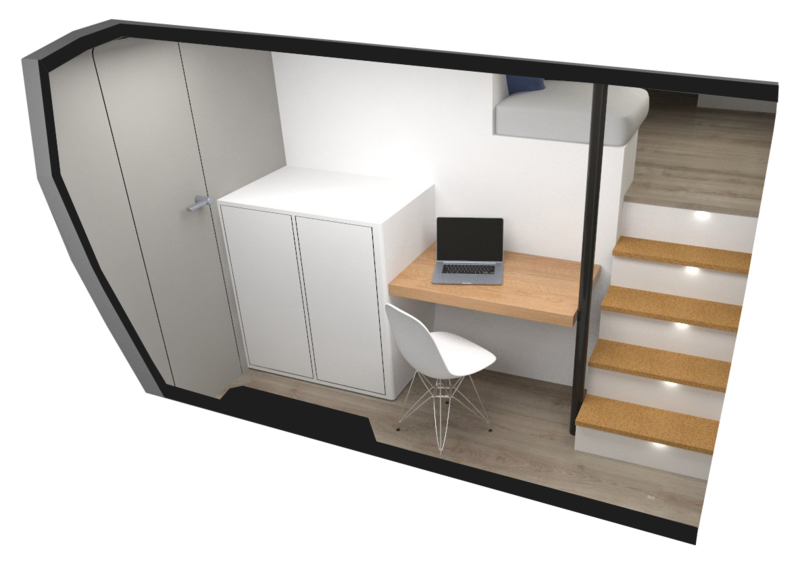 We created a simple, rigid, modular interior system for the 2 m middle sections of each hull. This will allow you to set up different layouts in less than two hours. 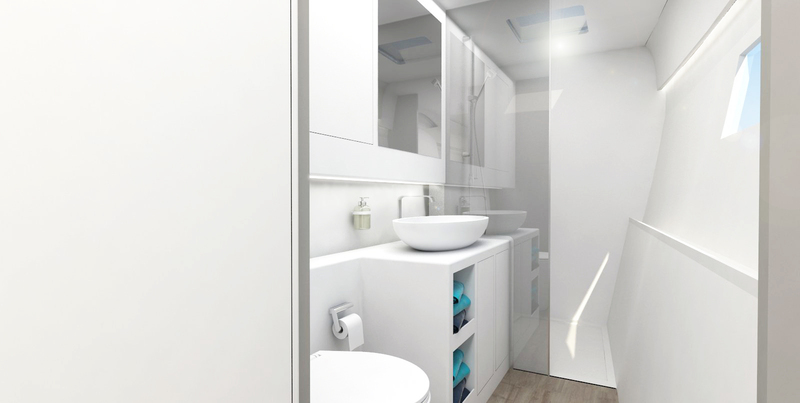 You can combine: cabinet 120 cm high, cabinet full hight, dressing table/ desk, berth 75 x 200 cm. 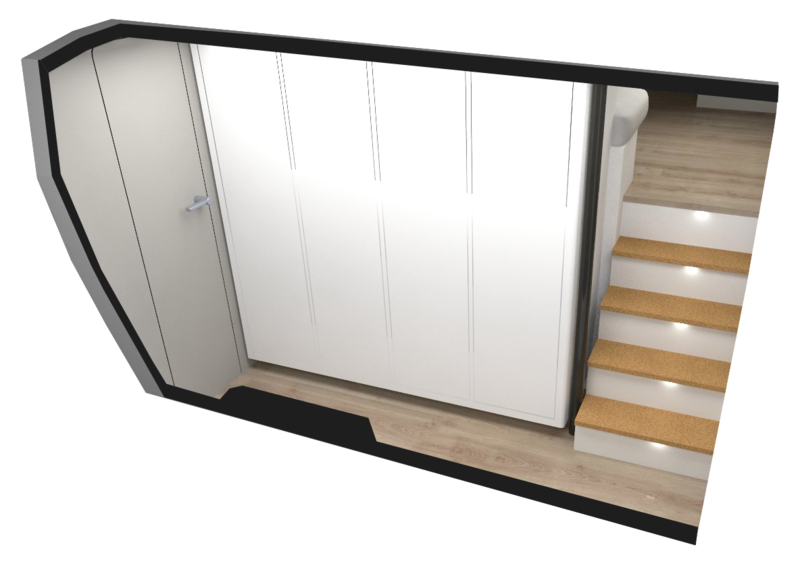 If you combine two full hight cabinets with a dressing table, the hull will represent a perfect owners cabin. 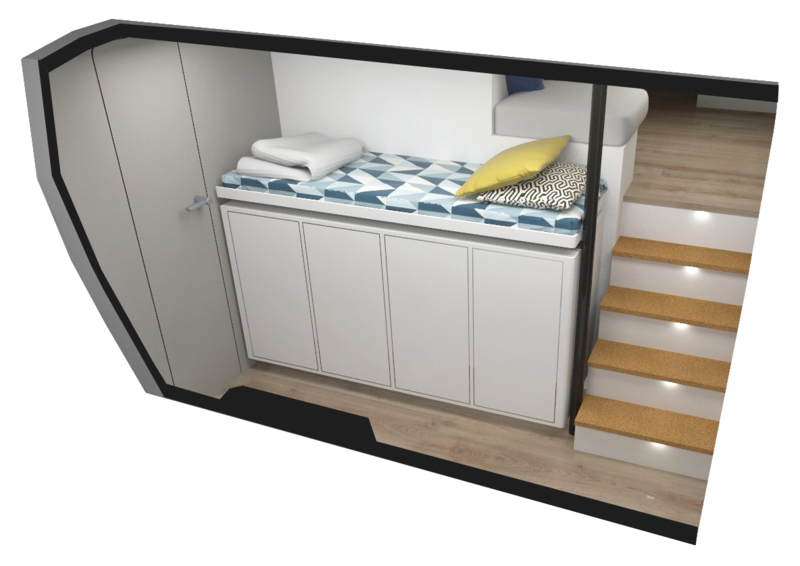 Or you choose four 120cm high cabinets and put a berth on top as a reserve bed for the grandchildren. 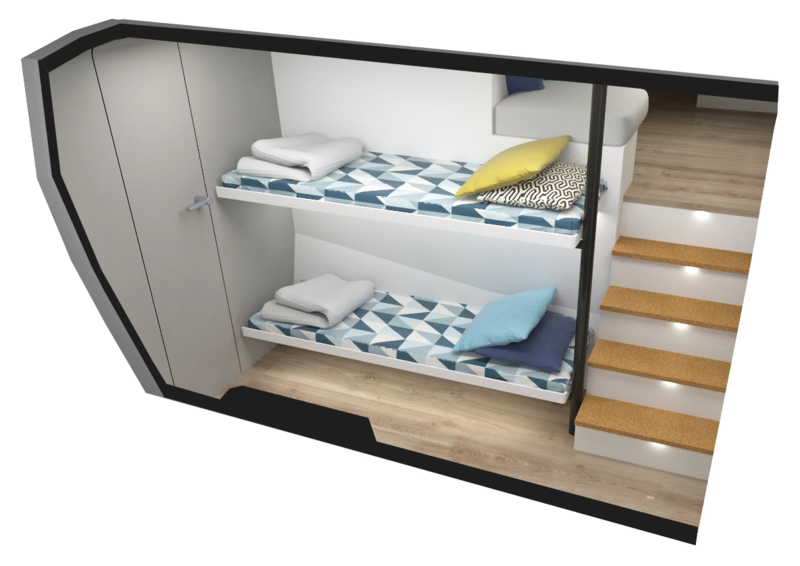 Or you change to two berths as a bunk for the two or thee races you are doing with friends during the year. You will have the arguments on your side, once wanting to sell the catamaran. He has been sailing in brittany since he was a child. He has a degree from Ensta Bretagne as naval engineer and a master degree in Paris La Villette architecture school in boat design. Sub contract work for well known naval designers followed. He designed and built the Pandora 8.50 sailing catamaran, and then designed for boatyards such as Corsair Marine and Slyder Yachts. The first two boat he designed for these two shipyards were nominated as boat of year in Europe and the Pulse 600 for Corsair since received other awards in Europe and in the US. 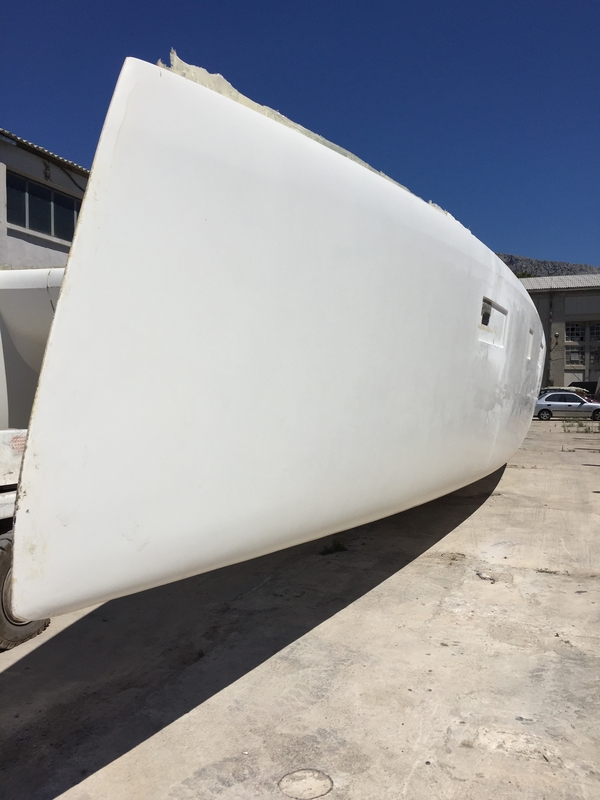 Francois has a deep understanding for the latest hydronamics for multihulls. He has a Bachelors Degree in Product Design from the Netherlands and then worked in Stuttgart / Germany and Barcelona / Spain as a Product Designer. He then studied Yacht Design at Politecnico Milano for a Master Degree. Jonas now works in Fano / Italy as a Yacht Designer, where he founded his own design studio. 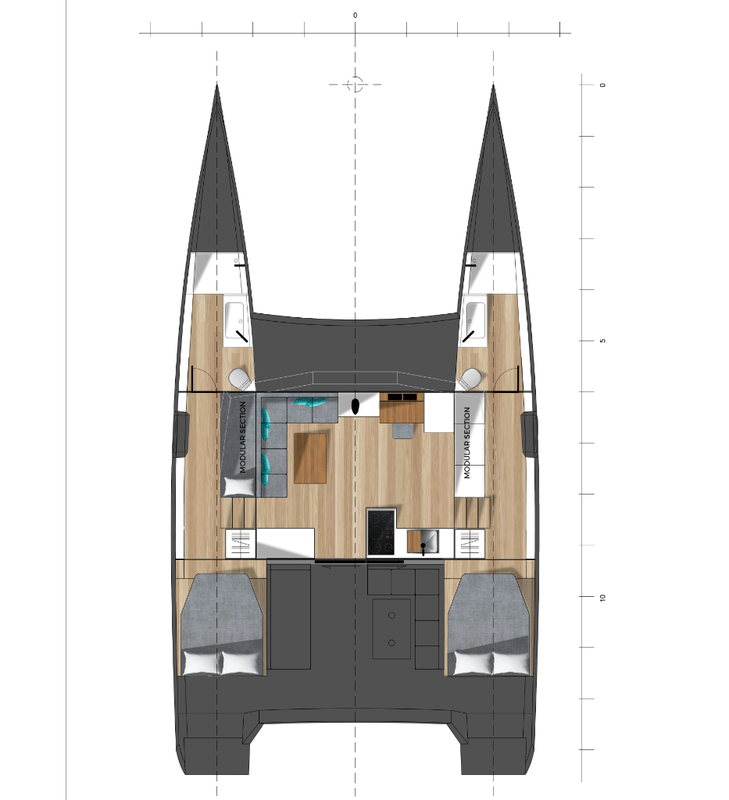 Currently he is working with various international clients in the Design Field in with an emphasis on yacht design. Jan started sailing in the British Channel since boyhood. Sailing many different multihulls in the last 30 years, including some of the latest types have built up experience to know, what a Catamaran should be like. He has an extensive background in project management and his technical background is versatile. He has searched many years to put together the best team to develop this first catamaran of the new founded company ‚vcatamaran‘. Working as a technical Designer in various Fields for the last 35 Years Christopher’s experience is not only limited to his main Qualification in designing the technical and electrical systems for Vcatamaran, being responsible for the production of several industrial projects also helps us in realizing and engineering our boat.